Eckoh ECK has won its largest ever contract, to provide secure payment solutions to one of the largest corporations in the United States. The contract worth $7.4m. has delighted the CEO of Eckoh and is expected to make a modest financial contribution in the current year, with the majority coming in the following two financial years. Range Resources Ltd. RRL has seen a significant improvement in operational and financial performance during the 12 months to the 1st June. Revenue increased by 55% to $13.1m.after a 25% increase in production from Trinidad and a 25% increase in the realised oil price from $44.7 per barrel to this years $55.4 dollar per barrel. The loss for the year has been materially reduced from last years US $54.4 million to $17.5m. Imaginatik IMTK Updates that its financial performance has improved since the 1st June.and not only that but its sales pipeline has has been cleaned, whatever that may mean. The immediate focus of the new management team is for the business to become self funding as soon as possible. Iomart Group IOM has continued to perform strongly in the six months to the 30th September with both revenue and trading profits expected to be well ahead of last year’s first half. Good levels of new business have continued to be won and these are expected to filter through into increased sales in the second half. Wey Education plc WEY reports that in its traditional online school and B2B division sales are materially ahead of the same time last year. The formation of the joint venture in China is taking longer to complete than originally anticipated but the delay is not expected to have any material effect on revenues or profits for the current year. Big Sofa Tech. Grp. BST Claims to have made considerable progress in the half year to the 30th June, with revenue up by 20% on last year and work commissioned showing a rise of 100% compared to a year ago. The company is still loss making but the loss for this half year has been reduced by 19% from £2.1m to £1.7m. Crossword Cybersecurity (CCS) has signed a memorandum of understanding with IP Group, covering the commercialising of cybersecurity intellectual property from universities. Ananda Developments (ANA) says that investee company iCAN Israel-Cannabis Ltd has signed a memorandum of understanding with Yom Chai. The deal involves the development and validation of a cannabis-based treatment for Crohn’s Disease, Autism and other neurological and gastrointestinal diseases. The agreement will generate revenues for iCAN, as well as obtaining a stake and potential future royalties. Supported housing developer Walls and Futures REIT (WAFR) ended March 2018 with a NAV of 92p a share. Full year revenues were 127% higher at £103,000 and the company moved into profit. The first supported housing property was completed during the period. The board wants shareholders to approve a new management incentive plan at the company’s AGM. There was a £88,000 cash outflow for Lombard Capital (LCAP) in the year to March 2018, but the investment company has moved from net assets to net liabilities. There is £2,154 in the bank plus £112,500 in investments. Since the year end, £320,000 has been raised from subscriptions for 7.5% 2020 unsecured loan notes. Primorus Investments (PRIM) and Gunsynd (GUN) are selling their direct interests in the Horse Hill prospect to UK Oil and Gas (UKOG) for cash and shares. Primorus will receive £375,000 in cash and £1m in UK Oil and Gas shares at 1.75p each for its 5% stake in Horse Hill Developments Ltd (HHDL), while Gunsynd will receive £50,000 in cash and £500,000 in shares for its 2% stake. Tracsis (TRCS) says that full year revenues were ahead of expectations at around £40m and profit will be better than expected. There was £22m in the bank at the end of July 2018. The margins of the traffic and data division are improving. Audio visual equipment distributor Midwich Group (MIDW) is acquiring Nuremberg-based Bauer und Trummer, which has annual revenues of €21m. A potential partner has ended its interest in the Bahamas-based oil and gas prospects of Bahamas Petroleum (BPC) and that knocked two-thirds off the share price. BPC received $1m in exclusivity payments from the international oil and company and it has started talks with other third parties. KEFI Minerals (KEFI) has signed heads of agreement with Ethiopian investors which are setting up a vehicle to make a $35m investment to finance the Tulu Kapi gold project. The first investment of $9m should be made in the current quarter. Caledonia Mining Corp (CMCL) has agreed to acquire a further 15% of the Blanket gold mine in return for the cancellation of a $11.5m loan and 730,000 shares. That takes the Caledonia stake in Blanket to 64%. The dividend will be kept at 27.5 cents/share. Waste gasification to energy technology provider EQTEC (EQT) has finished a strategic review following the appointment of a new chief executive. The focus will change to the delivery of customer requirements. Additional technological expertise will come from an alliance with CT3 Ingenieria. AdEPT Telecom (ADT) is a paying an initial £5m for Shift F7 and this should be earnings enhancing. The two companies have worked together for more than a decade. AdEPT chief executive Ian Fishwick has bought 10,196 shares at 373p each. Thor Mining (THR) has completed the definitive feasibility study for the Molyhil open pit tungsten project. The post-tax NPV is A$101 and project payback would be less than 18 months. Molyhil has opex costs of tungsten of $90/mtu, compared to an average of $157/mtu for other tungsten projects. Data and analytics services provider D4T4 (D4T4) says that it has received the £19.5m of trade debtors in the balance sheet at the end of March 2018. Restaurants operator Fulham Shore (FUL) says revenues generated by The Real Greek and Franco Manca have increased. New openings will be financed out of cash flow. Chief executive Nabil Mankarious has acquired 127,000 shares at 12p each, taking his stake to 19.9%. Versarien (VRS) has signed two collaborations. A deal with AXIA Materials will lead to the development of graphene enhanced composite materials and smart graphene devices. The first two projects will be for smart buildings and electric vehicles. An agreement with AECOM will be focused on developing large-scale polymer structures for civil engineering infrastructure projects. Broadcast software provider Pebble Beach Systems (PEB) has moved back into profit at the adjusted level in the first half of 2018, but that is after adjusting for £400,000 of amortisation of capitalised development costs. If that amortisation charge is not excluded the company would have been around breakeven. Net cash generated from operating activities was £126,000, but there is an outflow of £254,000 after capitalised investment. Most importantly, net debt is £10.5m. Debt repayments have started with £850,000 due to be repaid in the second half. Facilities management services provider Mortice Ltd (MORT) reported a 29% decline in pre-tax profit to $3.9m. Net debt was $18.4m at the end of March 2018. The minority interest in Singapore-based Frontline Security has been acquired for $3.5m. Wey Education (WEY) says it is planning for significant growth next year, having exceeded market expectations of revenues of £4.1m in the year to August 2018. The first sales from the Chinese joint venture should be in September. A general meeting is being held to enable the issue of more shares and to create distributable reserves to allow a dividend to be paid. Tekmar Group (TGP) intends to acquire Subsea Innovations for up to £4m. Subsea is focused on the oil and gas sector and it is involved in back deck equipment and subsea pipeline repair clamps. The deal includes £3m of fixed assets. Veltyco (VLTY) has trade receivables of €8.9m, higher than in July, with €5.4m owed by Celestial, €1.5m of which relates to 2017. The current cash balance is €1.3m. Veltyco will launch its own regulated online trading brand. Betsson Services has renewed its contract until May 2021. Packaging manufacturer and distributor Macfarlane Group (MACF) increased its interim pre-tax profit by 39% to £3.53m. The growth in profit came from the distribution division on the back of higher sales to internet retailers. Net debt was £11.1m at the end of June 2018. The interim dividend is increased by 8% to 0.65p a share. London and Associated Properties (LAS) is broadening its investment remit to areas other than retail property. Diluted NAV was 54.5p a share at the end of June 2018. Bisichi Mining (BISI) increased its pre-tax profit from £243,000 to £3.97m on the back of strong demand for coal. Standard list shell daVictus (DVT) still has £431,000 in the bank. The board continues to look at food and beverage businesses. Ashley House (ASH) is expected to achieve its full year profit target of £1.8m, although that includes a non-cash write back. The health and community care property developer had year-end net debt of £1.5m. The Morgan Sindall joint venture has reached financial close on its first extra care apartments and bungalows scheme in the Isle of Wight with a further scheme expected to reach financial close in the next few weeks. Modular building business F1 Modular lost money last year. There is work manufacturing classrooms for schools and projects in the retail sector so it is not dependent on residential and health development. Maureen Moy has taken her stake to 10% after buying 1.9 million shares at 13.23p a share. Dairy and livestock services provider National Milk Records (NMR) generated revenues of £5.32m in the three months to March 2018. This means that revenues are £1.51m ahead so far this year, although the comparatives are weak. Herdwise, the screening service for Johne’s disease and other testing services are providing growth with a small improvement from milk recording services. Rising milk supply has started to hold back milk prices. There will be a one-off benefit in the fourth quarter and the first quarter of next year from a contract to supply 10,000 genomic tests that should help to provide information to improve resistance to bovine TB. NMR is one of the nominees for NEX Exchange company of the year at the 2018 Small Cap Awards. Forbes Ventures (FOR) says that the majority shareholder in challenger bank Civilised Investments Ltd has exercised warrants that increased its shareholding to 95.7. Warwick Capital Partners is also underwriting a £12m subscription, although £4.65m of this can be subscribed by minority shareholders. This would increase the overall valuation of the bank to £20m. Forbes owns 0.05% of Civilised Investments prior to the subscription and it has not said if it will be investing any more cash. Gledhow Investments (GDH) had £172,000 in cash at the end of March 2018 but £20,000 is trapped in a Beaufort Securities account. NAV has increased from £510,000 to £869,000. Gunsynd (GUN) says that Brazil Tungsten Holdings, the company it owns a 6.18% stake in, has restarted mining operations after a government suspension was lifted. Coinsilium Group Ltd (COIN) will advise FANTOM Foundation on the $39.8m token generation event due to start on 15 June. FANTOM is using Directed Acyclic Graph (DAG) as a smart contract platform. This is an alternative to blockchain, which should be faster and have lower fees. IMC Exploration Group (IMCP) is focusing on the completion of works programmes in its three principal projects. The joint venture with Trove Rehabilitation only requires ministerial approval to complete. Eamon O’Brien has been appointed as a director and he will become chairman. Kathrine Byrne is also joining the board. Nial Ring and Liam McGrattan will step down from the board. A strong performance in the used vehicles market and continued growth in aftersales helped to offset the downturn in the new vehicles contribution at Cambria Automobiles (CAMB) in the six months to February 2018. Underlying operating profit still fell from £5.8m to £5.3m. Interim pre-tax profit was £4.8m. Full year pre-tax profit is expected to decline from £11.3m to £9.5m. The significant capital investment programme continues but net debt is minimal. Vertu Motors (VTU) also performed well despite the tough background in the motor dealer sector. In the year to February 2018, adjusted pre-tax profit fell from £31.5m to £28.6m on flat revenues. The full year dividend was increased by 7% to 1.5p a share. It appears that trading may be starting to improve and the benefits of the current investment programme are yet to show through. Net cash is £19.3m. A further dip in profit to £25m is expected this year. CEPS (CEPS) reported flat 2017 revenues but the underlying pre-tax profit jumped from £146,000 to £902,000. The biggest improvement in profit came from Friedman’s and Aford Awards, while CEM Press made a larger loss. TyraTech Inc (TYR) says sales of the PureScience poultry mite treatment are building in the US and a launch is planned in Europe. Trials of a treatment for intestinal worms in pigs have shown a 70% reduction in the worms. TyraTech has shown that it can develop effective products and the remaining cash from the sale of Vamousse will finance further product development and trials. Deltex Medical (DMG) had a tough 2017 but lower cost meant that the loss was reduced. The medical monitoring equipment and consumables supplier has won significant contracts in the US and France. Revenues dipped from £6.3m to £5.9m, while the loss was down from £2.4m to £2m. Annualised cost reductions of £1m will partly show through in 2018. The UK remains tough with potential recovery later in the year. International business should grow. A £2m fundraising should provide enough cash to invest in the technology and cover a reduced loss. HaloSource Inc (HALO) has disappointed the market again. This time the auditors have not allowed some of the sales shipped at the end of 2017 to be included in revenues. Cantor Fitzgerald has maintained its 2018 loss forecast at $3.4m, down from $5.7m. The cash outflow should be lower. Sprue Aegis (SPRP) has come to an agreement with BRK over the termination of their distribution and manufacturing agreements. Sprue Aegis will have to pay £11m in instalments up until December. There will be a £3.8m exceptional charge in the 2017 accounts. The full year results will be published on 15 March. Wey Education (WEY) reported interim revenues 44% ahead at £1.74m and an improvement in underlying pre-tax profit from £75,000 to £145,000. An initial contribution from Academy 21 accounted for part of the improvement. A 2017-18 profit of £500,000 is forecast, rising to £2.5m the following year. Trading in the shares of Lionsgold Ltd (LION) has been suspended following the completion of the acquisition of Goldbloc, which has developed a digital gold currency. This is deemed as a change of business. The suspension could last up to four months. Fox Marble (FOX) increased revenues by 50% to €1.2m in 2017 and lost €3.4m. This year will be more significant with the processing factory up and running and capital investment made in machinery. There was €440,000 in the bank at the end of April 2018. Out-of-hospital care services provider Totally (TLY) has secured the renewal of an urgent care services contract worth €1.2m with the Northumbria Healthcare NHS Foundation Trust. Westminster Group (WSG) has admitted that a previously announced Middle East contract is in Iran and it has still to become effective. The current political situation could scupper the deal or at least delay it. Microsaic Systems (MSYS) has signed a distribution agreement with Rightek, which will distribute the Microsaic 4500 MiD mass spectrometry detector in Taiwan. Stem cell services provider WideCells Group (WDC) has commitments to invest £1.47m at 3p a share and is offering the chance of additional investment of up to £450,000, via a bookbuild using the Teathers app and that closes on 21 May. WideCells has still not been able to publish its 2017 accounts so trading in the shares remains suspended. Directors have loaned the company £215,000. At the end of June 2017, there was cash of £869,000 and debt of £634,000, before any of the director loans. WideCells intends to repay £120,000 of debt, spend £150,000 on product development, £110,000 on the CellPlan platform and £33,000 on WideAcademy. The other £1m plus will pay expenses and provide working capital. Nanoco (NANO) will receive a £1.8m milestone payment from its unnamed US-listed partner. This is the second of three milestone payments. Falcon Media House (FAL) has raised a further £200,000 from a convertible loan note issue, taking the total to £3.14m. The conversion price is 2.5p a share. Treatt (TET) has sold pressed vegetable seed oils supplier Earthoil Plantations for £11m. That takes pro forma net cash to £17.5m. In the six months to March 2018, Treatt increased revenues by 14% to £53.6m and underlying pre-tax profit improved from £4.79m to £5.77m. Gowin New Energy Group Ltd (GWIN) is moving into the tea market, where its chief executive already has experience. Gowin intends to buy a 15% stake in a Cayman Islands-registered tea business and this new business will link up with experience of the industry that are based in Taiwan. The plan is to raise £5m from a preference share issue at 2p each, with an initial £2m raised, and use part of this cash as a loan to the new business. There will be a fixed annual preference dividend of 2%, while the loan will geerate 3% a year. Walls & Futures REIT (WAFR) raised £1m when it joined the NEX Exchange Growth Market. There was £843,000 in the bank at the end of March 2017 and since then £475,000 has been spent on a building in Stroud that is being rented to a supported housing operator. The private rented housing portfolio, which is properties in the Wimbledon area, is worth £2.15m and the group NAV is £2.98m, equivalent to just over 90p a share. The focus is supported housing and there are plans to raise more cash from a placing and open offer in order to fund more property purchases. Lombard Capital (LCAP) is close to finalising a 7.5% 2020 unsecured loan note series 2 issue to raise between £500,000 and £3m. This will be invested so that it provides a fixed income and capital return. An impairment charge against the book value of the Royston Hill property meant that Etaireia (ETIP) lost £622,000 last year. The company expects to complete the purchase of properties at the Whitehouse Office Park having secured bridging finance. The current portfolio of properties should generate enough income to make the company profitable. Block Energy (BLOK) has raised £250,000 at 0.85p a share and this cash will be used to finance the proposed move to AIM. Block has also issued 70 million shares to complete the acquisition of the 90% working interest in the Satskhenisi production sharing agreement in Gerogia. This means that Iskander Energy owns 13.3% of Block. Healthcare recruitment company Positive Healthcare (DOC) reported revenues of £7.8m and a loss of £276,000 between November 2015 and March 2017. The two majority-owned subsidiaries were included for nine months. Andrew Sparrow is replacing Malcolm Ball as chief executive of WMC Retail Partners (WELL). Crossword Cybersecurity (CCS) has appointed Rob Johnson, a former senior investment director at AIM-quoted Mercia Technologies, as chief operating officer. Primorous Investments (PRIM) has made six investments in the past month and four of them are seeking to join AIM in 2018. Primorous has invested £400,000 in a £5.25m fundraising for software company Engage Technology Partners and £200,000 in online shopping and rewards firm WeShop. The other two potential AIM flotations are the investee companies Sport:80, where £100,000 was invested, and TruSpine Technologies, where £500,000 was invested to help TruSpine’s minimally invasive spine stabilisation devices to gain FDA clearance. Doriemus (DOR) has filed a prospectus for an ASX listing. A 400-for-one share consolidation has been completed in advance of the listing. The new investing policy is focusing on oil and gas assets in Asia Pacific. IT healthcare software and services provider EMIS (EMIS) reported a 1% increase in interim revenues to £79.2m even though the healthcare market is tough, particularly when it comes to hospital services. EMIS’s recurring revenues were 84% of the total. Profit was slightly lower. There could be a small fall in full year profit but the 10% increase in interim dividend to 12.9p a share indicates the strength of cash flow and the longer-term potential. Net cash was £10.5m at the end of June 2017. The newly created patient division is a growth area and the patient.info website is still being developed so that ecommerce revenues can be earned. Digital TV software provider Mirada (MIRA) has secured a SaaS-based contract with ATN International and four of its cable networks in the Caribbean. In the past Mirada has been paid every time a viewer signs up for the service but this contract is based on recurring subscriber fees. There will still be an initial upfront payment for implementation services but the rest of the revenues will be generated on a monthly basis. Mirada is expected to release its 2016-17 annual report before the end of September so trading in the shares should not have to be suspended. Mirada will require additional working capital facilities and these are being negotiated. MP Evans (MPE) is acquiring a 10,000 hectare estate in Indonesia for $108m, including the assumption of $20m of debt. This will be funded by the sale of the company’s minority stake in another estate. Infrastructure spending will cost a further $30m over five years. The estate is just starting to build up production and it will become more significant in a couple of years time. NAV is £11 a share and Peel Hunt expects this to rise by more than 5% a year as group production increases. South America-focused gold miner Orosur Mining Inc (OMI) generated $9.7m from operations in the year to May 2017 thanks to lower operating costs and a higher gold price. There was net cash of $3m at the end of May 2017. Since the year end, Orosur has raised £3.2m at 14.7p a share and two new institutions invested in the placing. This will help to finance drilling at the Anza gold project in Colombia. The administrator of Fairpoint Group (FRP) is selling off parts of the group but there is no chance that shareholders will get anything. Consumer claims business IVA Assurance is being sold for £450,000 plus cash balances on completion. Allixium, another consumer claims company, has been sold for £53,000. The original Debt Free Direct business has been sold to Aperture Debt Solutions for £1.34m but unlike the rest of the proceeds this cash will pay Debt Free Direct creditors rather than the creditors of the holding company. Legal subsidiary Simpson Millar has sold Simpson Millar Financial Services to its boss for £271,000 plus up to £250,000 over five years. This cash will go back into Simpson Millar. Stockbroker Share (SHRE) will be paid £900,000 for work carried out relating to a potential partner that is not going ahead with a deal. Trading continues to be strong. Pawnbroker and foreign currency services provider Ramsdens Holdings (RFX) says that its pre-tax profit will be higher than expected this year. This is thanks to strong foreign exchange trading results and a higher gold price. Samuel Heath & Co (HSM) has appointed former Zeus Capital director Ross Andrews as a non-executive director. Real Good Food (RGD) says that EBITDA will be half its previous, already downgraded, expectations at £1m. The company is in discussions with its bankers to change the conditions of its bank facility. Educational services provider Wey Education (WEY) says revenues will increase from £1.5m to at least £2.4m and this will enable it to make a maiden pre-tax profit. There is still £909,000 in the bank. The figures for the year to August 2017 will be published in October. David Massie has taken his £33,000 annual salary in shares at 3.88p each. Conroy Gold & Natural Resources (CGNR) has appointed Dr Karl Keegan and Brendan McMorrow as non-executive directors. Another general meeting has been requisitioned by Patrick O’Sullivan, who owns 28% of Conroy, and it will take place on 6 October. He had asked for assurances that new directors would not be appointed. The previous general meeting successfully removed six directors but Conroy said the proposed appointments of Patrick O’Sullivan, Paul Johnson and Gervaise Heddle did not comply with the company’s constitution and they are being proposed as directors again. A hearing will be held at the High Court in Dublin on 14 September and that could affect whether the three people are upheld as directors prior to the new general meeting. The plan is also to remove Professor Richard Conroy and Maureen Jones from the board. Galileo Resources (GLR) has raised £1.09m at 2p a share to finance a joint venture with BMR Group (BMR) to develop the Star Zinc project in Lusaka, Zambia and also to finance exploration of the gold property in Nevada and the Glenover phosphate project in South Africa. Galileo had £1.1m in the bank at the end of March 2017. Galileo will lend $592,000 to BMR, which will be received once there is a settlement agreement with Bushbuck Resources for the acquisition of Star Zinc. This loan will eventually be swapped for 51% of the joint venture and $100,000 will be placed in escrow. Galileo can then increase that stake to 85% by funding $250,000 of work on the project. Back office optimisation software provider eg solutions (EGS) has signed a five year master supply agreement that will be worth at least £8.12m. This will kick-in next year and increases the order book of recurring revenues to £22.9m. In the year to July 2017 revenues were at least £10.5m. Cyber security software provider Defenx (DFX) has raised £1.25m from a convertible bond issue to add to the £1.74m raised from a share issue at 160p each. Defenx was trying to raise up to £2m via a bond auction carried out by UK Bond Network. Robin Williams has taken over as chairman of FIH Group (FIH) and the company continues to seek acquisitions. There was £15.25m in the bank at the end of August 2017. Trading is expected to be flat this year with modest growth in the UK but quiet trading in the Falkland Islands with additional retail competition. The low oil price is too low to prompt development of oilfields around the islands. Trading technology provider TechFinancials Inc (TECH) reported a dip in interim revenues from $9.86m to $6.97m mainly due to lower software licencing income. Pre-tax profit fell from $1.33m to $282,000. There was cash of $5.81m in bank at the end of June 2017. BATM Advanced Communications (BVC) is beginning to reap the benefits from past investment and the second half should show even more progress. Revenues have started to grow even though the corresponding first half included more significant sales of older networking products. Overall group interim revenues were 10% ahead at $49.8m with both divisions increasing their revenues. There was a 17% increase in R&D spending to $4m. There was an interim loss but Shore Capital still believes that BATM can break even this year. Ross Group (RGP) continues to seek an acquisition that would provide a more significant business for the company. In the six months to June 2017, revenues grew 51% to £93,000, while the pre-tax profit was one-fifth higher at £17,000. The balance sheet is weak with net debt of £6m but the major shareholder is supportive. That level of debt might put off some potential acquisition targets. Standard list shell Stranger Holdings (STHP) has signed non-binding heads of terms with Irish sustainable utility company Alchemy Utilities. This acquisition would be a reverse takeover. Alchemy is involved in waste to gas production, renewable energy and using waste energy to remove salt from water to produce drinking water (www.alchemyutilities.ie). Trading in the shares was suspended at 1.38p. Standard list shell Derriston Capital (DERR) had £2.2m left in the bank at the end of June 2017. Derriston has changed its investing strategy from a focus on medtech to technology and high growth sectors. Newbury Racecourse (NYR) generated a much higher profit from its core operations in 2015. There was a swing from an overall loss of £1.54m to a profit of £1.61m, on revenues up from £12.4m to £14.3m. This includes a profit on fixed asset sale of £722,000, up from £365,000 in 2014.Net cash was £1.69m at the end of 2015. The profit from the nursery business was flat. The number of racing days increased from 28 to 30 and attendances improved by 7% to 210,000. There was an increased contribution from conferences and events. Further redevelopment of the racecourse will be underway this summer. At 500p (475p/525p) a share, Newbury is valued at £16.7m. Diversified Gas & Oil (DOIL) is raising a further £3.5m from the issue of 8.5% unsecured bonds. This means that Diversified Gas & Oil will have raised more than £10m. The oil and gas producer has entered into a letter of intent to acquire assets in Ohio for $5.2m – a 50% discount to future cash flows. This deal will take the number of operating wells to more than 7,300, producing 510 barrels of oil per day and 23,500 mcf per day of natural gas. Recruitment software provider Bond International Software (BDI) has sold Strictly Education, which provides outsourced back office services to schools, for £7m in cash and a £4.3m loan note, which should be paid within six months. In 2014, the business made a profit of £1.8m on revenues of £10.2m. The initial proceeds will repay debt of £5.9m. This is the first disposal following the recent strategic review. Cash from this and other disposals will be returned to shareholders. Pharma services provider Ergomed (ERGO) is acquiring Haemostatix, which is developing products to treat surgical bleeding, for an initial £8m. A placing will raise up to £13m at 140p a share. The total cost of the acquisition could rise to £28m depending on achievement of milestones. The additional cash raised in the placing will help to accelerate the development of two treatments. PeproStat, a topical liquid haemostat to control bleed during surgery is ready for phase IIb trials. ReadyFlow is a preclinical treatment that is a gel packaged in a pre-filled syringe for use with irregular bleeding sites. Security and facilities management services provider Mortice Ltd (MORT) says that revenues will be at least 40% higher at $124m in the year to March 2016. The UK business acquired last September has performed strongly and will contribute one-quarter of the revenues. Singapore-based security business Frontline Security has also done well since acquisition. The full year figures will be published during August. Nostra Terra Oil & Gas (NTOG) is seeking finance to complete the acquisition of assets in the Permian Basin, New Mexico from Alamo Resources. Nostra Terra has extended the closing date for the deal to 31 May. Kayne Anderson Energy Fund V has received 282.1 million shares at 0.1p each in return for the extension of the closing date. The purchase price of the 50% working interest in the assets will be reduced by $370,000 to $2.5m and debt funding is being negotiated. Conroy Gold and Natural Resources (CGNR) has raised £1m at 18.5p a share and there are warrants attached to the ordinary shares exercisable at 37p a share. This will help to finance the development of the Clontibret resource in Ireland. There is a 600,000 ounce gold resource at Clontibret even though little of the site has been explored. A starter pit could have a net present value of $22m at a discount rate of 8% and using a gold price of $1,250 an ounce. The exploration target is 5 million ounces. Online education provider Wey Education (WEY) plans to add a premium brand service next January. This will be a semi-selective service for students with top quality academic results. There is £1m in the bank to finance the development of the new service and marketing expenses. The main service, which offers GCSE and A level subjects, is not selective and it is also expanding the range of subjects on offer. In the six months to February 2016, revenues were £700,000 and the loss was £467,000. The underlying InterHIgh trading business is profitable and the overall group loss includes £328,000 of flotation and legal costs. House broker Northland believes that security and tracking products developer Starcom (STAR) could breakeven this year. Starcom lost $1.8m in 2015 but new product launches should help it to do much better this year. The outcome may depend on the timing of the launch of the WatchLock Pro by its partner Assa Abloy, which has invested around $500,000 in upgrading the original product. Delays to the completion of the new product have held back Starcom but it should be on sale in the second half of 2016. Starcom raised £450,000 so it has cash to keep it going while it waits for sales to build up. Mariana Resources (MARL) has raised £6m via a placing at 1.82p a share. TSX-listed Sandstorm Gold Ltd has taken a 7.56% stake. Northland has increased its share price target from 4.8p a share to 5.4p a share. This takes into account a further £2m fundraising at the current market price in 2017. Mariana has plans for a dual listing on the TSX Venture Exchange. This process should be completed in three months Mariana withdrew from the Nassau gold project so that it can concentrate on the 30%-owned Hot Maden gold copper project in north east Turkey, which has an indicated gold resource of more than two million ounces. Packaging and labels supplier Macfarlane Group (MACF) is acquiring Glasgow-based protective packaging distributor Edward McNeil for up to £1.8m. Edward McNeil generated revenues of £3.6m in 2015. The business is a good fit with Macfarlane’s Linwood business. This follows the acquisition of Colton Packaging Teesside last month. Asia-focused consumer businesses investor Symphony International Holdings Ltd (SIHL) is, along with a partner, acquiring the holding company of luxury furniture brand Christian Liaigre. The brand has 26 showrooms in 11 countries. No purchase price was revealed. At the end of March 2016, Symphony’s NAV was $1.37 a share, helped by the strengthening of Asian currencies. That is nearly double the current share price. Peterhouse has resigned as broker to analytics technology company Trendit (TRIT) following the revelation that it has received less than one-fifth of the £4m it thought it had raised when it joined the standard list at the beginning of 2016. Trendit was expecting to receive funds from the sale of shares by Amnon Freudman, Ben Raelbrook and David Cohen. The flotation price was 5.53p a share and it has fallen to 4p (2.5p/5.5p). Trendit had no revenues in 2015. Netalogue Technologies (NTLP), which is an ecommerce platform developer, has announced its first dividend since 2012 when it paid 0.123p a share. The latest dividend of 0.246p a share and the shares go ex-dividend on 17 December. Netalogue had cash of £807,000 at the end of September 2015 and the dividend will cost around £120,000. Interim revenues fell from £689,000 to £552,000 and profit dipped from £165,000 to £38,000. Netalogue has withdrawn from the hosting business. At 3.95p (3.7p/4.2p) a share, Netalogue is valued at £1.9m. Hydro Hotel Eastbourne (HYDP) is maintaining its annual dividend at 18p a share. A dividend of 6p a share will be paid on 14 January (ex-dividend 17 December) and the 12p dividend on 5 May (ex-dividend 21 April). A slight increase in profit is expected this year. At 750p (725p/775p) a share, the yield is 2.4%. Titania Internet Ventures (TITP) is considering changing its investment strategy so that it can become involved in the renewable energy sector. The proposal involves entering into a relationship with a British wind turbine manufacturer. Titania had been involved in online penny auctions, but this business ceased more than two years ago, and before that it investigated a nursing home acquisition in Finland. The company was originally called Uranium Prospects. At 2.5p (2p/3p) a share, Titania is valued at £44,000. Leni Gas Cuba (CUBA) had net assets of £4.1m at the end of September 2015. Since then, £200,000 was raised at 5p a share but that went towards paying the £326,000 cost of joining ISDX. The pro forma NAV is around 0.8p a share. David Lenigas has bought one million shares at 1.437p a share, taking his stake to 142 million shares (28.7%). Lombard Capital (LCAP) has raised a further £122,500 at 3.5p a share via a share issue to one of its directors, Mark Jackson. His stake is 28.2%. At 4.5p (4p/5p) a share, Lombard is valued at £102,000. Unmanned aerial vehicles (UAV) services provider Strat Aero (AERO) is acquiring communications, flight control and hardware technology developer Aero Kinetics for $1.2m plus the taking on of working capital commitments. This will be financed by the issue of a $775,000 convertible promissory note with a 7.5% interest rate and a 6p a share conversion price, with the rest in cash. There will also be $80,000 0f legal fees and $150,000 will be required to finance an application for FAA Certification, which could be achieved in the middle of next year. There is potential contingent consideration, including warrants depending on certification and achievement of sales targets. This deal is part of the strategy to develop a vertically integrated business, which can offer a full solution to global clients. It also brings Aero Kinetics founder W Hulsey Smith to the group and he will take charge of the group’s technology operations. The acquired operations made a loss of $269,000 on revenues of $246,000 but this is under US accounting rules and all R&D is written off – more than $5m has been invested so far. Strat Aero is also raising £1.6m at 6.25p a share. Moving into software has helped to offset the volatility of the hardware division but it will not prevent Vislink (VLK) reporting disappointing 2015 figures. The broadcast and surveillance technology supplier has found market conditions for the hardware business tough and new product launches have yet to generate the hoped-for sales. Expected full year revenues will be in the range of £54m-£58m. The company’s debt facility has been increased from £10m to £15m because late hardware sales will increase debtors. Net debt is expected to be £5.8m at the end of 2015. The 2015 profit could be as low as £4.2m, down from £7.1m. There could be a partial profit recovery to £6.3m in 2016 – helped by cost savings. Standard Life trimmed its stake to 4.6%. Begbies Traynor (BEG) is expanding its property services business in order to offset the weakness of its core corporate insolvency business. In the six months to October 2015, revenues improved from £20.8m to £25.5m, while pre-tax profit rose from £2m to £2.5m. That is after a contribution from property of £6.11m in revenues and £1.16m in EBITDA, compared with nothing in the corresponding period. Corporate insolvency revenues and profit were lower. 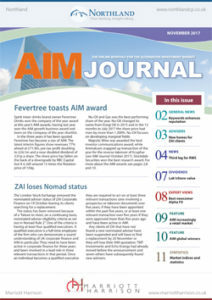 The interim dividend was unchanged at 0.6p a share. Net debt was £11.9m at the end of October 2015. A full year profit of £4.6m is forecast. Surface coatings developer Hardide (HDD) had a tougher second half as oil and gas demand declined. In the year to September 2015, revenues were flat at £3m and Hardide fell from profit to loss. The majority of revenues were in the first half. This year it is likely to be the other way round. The new facility in Virginia should be open soon. An £800,000 loss is forecast for this year and a much smaller loss expected next year. There was £2.33m in the bank at the end of September 2015, which provides enough headroom on current expectations. Snoozebox (ZZZ) is raising £5m at a hefty discount to the market price. The placing price is 6p – a 28.2% discount. The cash is required for the 2016 events season plus the evaluation of other opportunities. Snoozebox has already said that it has established a partnership with Dutco in the Gulf region. An EBITDA loss of £5m is forecast for 2015. Further cash will be required to take advantage of growth opportunities. Investment group Cathexis has taken advantage of the recent weak trading statement by construction and fit-out company ISG (ISG) and bid 143p a share. ISG believes that this unsolicited offer is too low. The bid values ISG at £70.8m. US=owned Cathexis has been an investor since 2012, when the share price was below the bid level, and it made a bid approach in June. It currently owns 29.6%. The current year profit forecast for ISG had been slashed from £17m to £11m. The bid is at two-fifths of the share price 12 months ago. Educational services provider Wey Education (WEY) made its move from ISDX to AIM on Friday and it raised £1.75m at 3.5p a share. Wey is capitalised at £3.29m. Retail stockbroker Share (SHRE) is taking on up to 3,000 nominee share dealing accounts from Barclays, which is exiting the services. The accounts will be transferred by the end of February 2016. Share previously took on nearly 8,000 certificated dealing customers from Barclays. Property services provider Waterman (WTM) has set a 6% target for its operating margin by 2019. Waterman’s business is predominantly in the UK and both the property and infrastructure sectors are strong. Sanlam forecasts a rise in profit from £2.7m to £3.7m in 2015-16. If Waterman can achieve its margin target then pre-tax profit could be around £6m in 2018-19. A dividend of 2.8p a share is forecast for this year. Bluebird Merchant Ventures Ltd, which plans to join the standard list,has a copper concentrate trading business combined with a stake in a potential gold mining project. The former can generate cash for investment in the mining project and other projects in the Philippines. Bluebird’s management lives in the Philippines so it has local knowledge. Bluebird’s trading operation is taking advantage of the difference between the price of copper concentrate in the Philippines and the international price. So far, 18MT has been shipped and once Bluebird is shipping 100MT /month then it should be generating enough cash to cover its corporate overheads. The plan is to increase monthly shipments to 500MT/month, which would provide a sizeable surplus of cash to invest in other ventures. This includes other commodity trading opportunities as well as mining projects that are near to production or have been in production in the past and can be reopened. The potential gold mine will cost $15m to bring into production. It will take around 18 months to construct the mine once the necessary permissions are obtained from the authorities. At a gold price of $1,160/ounce, the NPV of the project would be around $13m. That is based on production of 100,000 ounces over five years. Challenger Acquisitions (CHAL) has finally completed its deal to acquire the businesses of Starneth, which develops observation wheels, and been readmitted to the standard list. AIM-quoted Teathers has sold its stake for an average price of 50.3p a share, raising nearly £72,000 – a gain of £21,000. The Challenger share price ended the week at 41p. 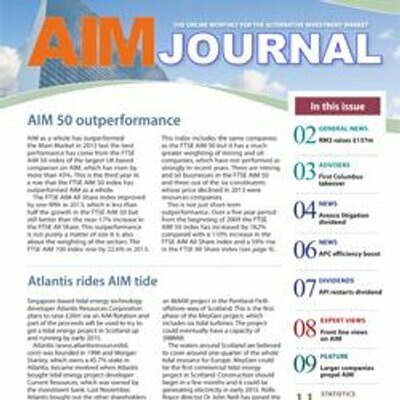 Latest edition of AIM Journal, including why AIM volumes are likely to decline and Purplebricks flotation, available here.